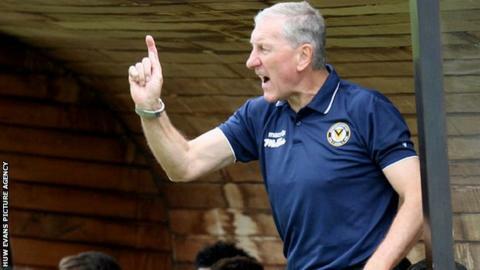 Manager Terry Butcher insists there is still "great hope" for League Two bottom club Newport County. County travel to play Dagenham & Redbridge on Saturday looking for their first win of the season. But Butcher, who is confident of recruiting an experienced player next week, says its too early to talk of a crisis at Rodney Parade. "If we were getting smashed every week there would be no hope, but we are not," said the former England captain. "That is why I say there is great hope because of the way we are playing and the way we want to continue play our football. "If we do carry on those same lines and produce the performances the results must come, they have to." County will welcome back defender Danny Holmes after suspension as they look to build on the solitary point they have accumulated this season from seven games. Butcher is keen to draft-in more experience to help his youthful squad. "We have made good progress on that, but it won't be before the weekend," he added. "But we are certainly looking at next week to get someone else in." Meanwhile, the Newport County Supporters Trust, who are seeking funds to take over the club, say they have raised £108,000 so far in the third week after their share launch. They have until 30 September to reach their target of £195,000 and Butcher believes an upturn in results will help their cause. "It does not go hand in hand, but it will certainly boost the Trust efforts and financially it will help them if we can get wins," he added.